Blanch parsley in boiling water till tender. Refresh in ice water. Blend in the kitchen whiz with a little New Zealand venison stock and olive oil, season. Preheat your oven to 220 ̊C. Heat a pan with some olive oil. Combine all of the ingredients for the coriander crust, before rolling each piece of venison tenderloin in it making sure it is completely covered. Sear in the hot oil on all sides, then place in the oven and leave for 2 minutes depending on the thickness of your tenderloin. Leave the meat to rest in a warm spot on a wire rack for 3 minutes. Warm olive oil in a pan, add all of the vegetable and herb ingredients and warm through for 10-15 minutes so that all of the flavours infuse into each other. Arrange equal portions of the vegetables on to hot plates. 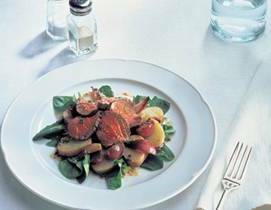 Slice each piece of New Zealand venison into 3 pieces and arrange on top of the vegetables. Heat the parsley jus and drizzle around the meat. Complete with a drizzle of olive oil and balsamic vinegar.